Janelle and Lou had an amazing engagement session at the end of August! Their wedding will be in June of 2018! The ceremony is at Prince of Peace Church in Niagara Falls and reception at the new Double Tree in Niagara Falls! After this beautiful engagement session, we can not wait until their wedding day! We started their engagement session at Eveningside Winery in Lockport, NY! We had the whole place to ourselves. It was a gorgeous day! The owner let us go where ever we wanted for photos. We worked in the vineyards and around the barns! Janelle had mentioned this sunflower field to us earlier in the week! Her and Lou live right down the road and knew the owners were letting people stop and take photos and enjoy this amazing creation they planted! We found out that morning the story about the field was in the Buffalo News. When we pulled up, closer to sunset, there were about 50 cars parked on the road. There were people everywhere enjoying the sunflowers. We had to do a lot of maneuvering to try and get photos without other people in them. This bride and groom to be were awesome and went with the flow! We really wanted Lou to pick up his fiance, as you can see in this image! He had to do it a few times, as we had some photobombs or needed to adjust lighting. We did use some off camera lights to light up the couple. Their outfits worked out great in the field as well! The black helped them to stand out among the colorful sunflowers. 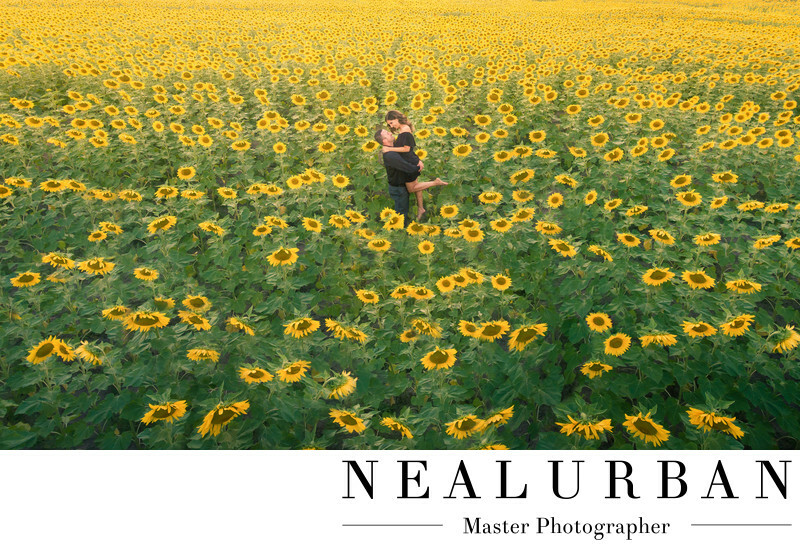 This field of yellow and green was so amazing and we were so happy we were able to do engagement photos for this lovely couple there. Thank you Chad and Louise Danielewicz for planting this beautiful sunflower field for all to enjoy! Location: Route 31 and Baer Road, Sanborn N.Y.